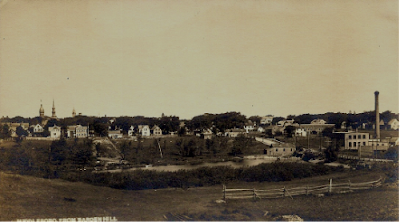 This view of Middleborough Four Corners taken from above the Nemasket River about 1905 looks westward towards the town center. Visible on the horizon line (from left to right) are Middleborough Town Hall, the Central Congregational Church, the Central Baptist Church, Leonard and Barrows shoe manufactory on Center Street, the Forest Street standpipe and the Central Methodist Church. In the foreground, on the opposite bank of the river, is the land now occupied by Spencer Street and the Middleborough Housing Authority. Originally, it was used for a small landfill. Mill houses along both Wareham Street at the right and Jackson Street at the far right may be seen as can the newly-built Middleborough Public Library peeking through the trees. Glimpses of the Cushing House at the corner of Wareham and Lincoln Streets as well as the nearby trolley car barn (later Maxim Motors) may also be seen. The Municipal Light Plant is easily recognizable on the right, though its smokestack is long since gone. Across Wareham Street from the plant, on the edge of the river is the so-called "Ocean House". In 1908 the building was condemned and two years later in 1910 it was torn down.